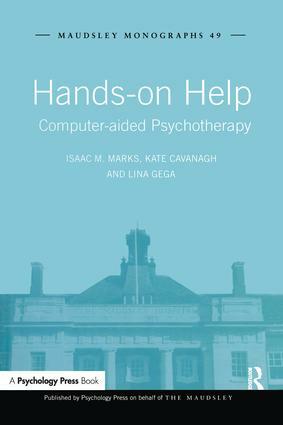 Hands-on Help is a narrative review of the mushrooming field of computer-aided psychotherapy for mental health problems as a whole, from the time it began in the 1960’s through to the present day. The many types of computer-aided psychotherapy and how each might be accessed are detailed together with the pros and cons of such help and the functions it can serve. The authors review prevention as well as treatment. The book describes and summarizes 97 computer-aided self-help systems in 175 studies according to the types of problem they aim to alleviate. These include phobic, panic, obsessive-compulsive and post-traumatic disorders, depression, anxiety, eating disorders, sexual problems, smoking, alcohol and drug misuse, schizophrenia, insomnia, pain and tinnitus distress, and childhood problems such as encopresis, autism and asthma. Within each type of problem the systems are described according to whether they are used on the internet, CD-ROM, phone, handheld or other device. The final chapter shows how internet self-help systems with phone or email support allow clinics to become more virtual than physical. It also discusses methods of screening suitability and of supporting users, constraints to delivery, uptake and completion, cost-effectiveness, and the place of computer-aided self-help in healthcare provision. This informative book will be essential reading for psychiatrists, psychologists and all other mental health professionals interested in broadening their understanding of computer-aided psychotherapy.